"Just Kids" is just another Jersey-factory-girl-runs-to-New York-and-hooks-up-with-bisexual-art-pornographer-on-her-way-to-rock 'n roll-stardom story. It details Patti Smith's evolution from tentative neophyte to rock-and-roll poetess, woven through with her unique relationship to Robert Mapplethorpe, a triumphant artist whose own untimely ending, alas, makes for engaging literature. The place is lower Manhattan. The time-period is the mid-1960s and 1970s when Mapplethorpe and Smith are, age-wise, a "beat behind" the reigning princes and princesses of rock's golden age. As such, she is influenced artistically by the Rolling Stones, The Beatles, Jimi Hendrix, Bob Dylan, and Janice Joplin for whom she pens poetic cycles while absorbing political pointers from Jean-Luc Goddard's "One-Plus-One." The life-as-artist anecdotes have a familiar ring: hunger, rejection, perseverance, and a healthy amount of name dropping. Smith has affairs with Jim Carroll, Sam Sheppard and a guy from Blue Oyster Cult. Allen Ginsberg mistakes her for a pretty boy in the Automat, and Gregory Corso imparts stern advice to the budding scribe inside her. They are revealing tales that highlight Smith's achievement as survivor of an era peopled with fascinating characters demolished by addictions and carelessness. "Just Kids" is the portrait of a New York City not completely subsumed into the grid of overpriced realty, before the Internet, where artistic ambition had a geographic component and required settling into some dump on the mighty Isle. Here is "art" before its subsequent elevation to bourgeois respectability. To an artist of today's saturated market, the idea that you could install yourself at the Chelsea Hotel and initiate apprenticeships with living legends seems, with the benefit of hindsight, a no-brainer. One can only assume that, in those days, choosing art meant the painful burden of rejection from loved ones and dangerous uncertainty on the path ahead. So, as time capsule, "Just Kids" is just great. But autobiographies should tell us something we don't know about somebody. They can be intriguing when it comes to artists; usually reinvented characters very mindful of their own brands, of what they show and don't show the world. And who does Patti Smith tell us who she is/was? For starters, because it's really how she got it going, Patti Smith is/was American as apple pie; thrifty, industrious, entrepreneurial, and self-involved, her Rimbaud-inspired disdain and punk rock posture notwithstanding. "I scoured secondhand stores for books to sell. I had a good eye, scouting rare children's books and signed first editions for a few dollars and reselling them for much more. The turnover on a pristine copy of 'Love and Mr. Lewisham' inscribed by H.G. Wells covered rent and subway fares for a week." And she is a fashionista of the first rank. Long before Patti Smith was confident enough to confront an imposing poetry world, she parsed a personal vocabulary in clothing ensembles that, 30 years on, she remembers down to the last accessory. "I dressed in a manner that I thought a boy from Delaware would understand: black ballet flaps, pink shantung capris, my kelly green silk raincoat, and a violet parasol, and entered Cinemabilia where he worked part time." And she is materialistic. Not flat-screen TV materialistic, for sure, but tightly tied to, and moved by, objects tactile and tangible. Before joining Mapplethorpe for a photography shoot she, "laid a cloth on the floor, placing the fragile white dress Robert had given me, my white ballet shoes, Indian ankle bells, silk ribbons, and the family Bible, and tied it all in a bundle." During the shoot she is stricken with anxiety that is eased by Mapplethorpe's knowing voice and a change into dungarees, boots, an old black sweatshirt. Smith interprets this evolution as an expression of certain ideas she and the photographer have discussed prior. Ideas about the artist seeking contact with the gods, but returning to the world for the purpose of making things. Her conclusion to the section does not surprise: "I left Mephistopheles, the angels, and the remnants of our hand-made world, saying, 'I choose Earth.'" As for Mapplethorpe, especially if you're a foot soldier in the art world, he seems a rather common phenomenon: ambitious and single-minded in his craving for fame. Patti's lazy percolation into what she would ultimately become makes for an infinitely more interesting yarn. One gets the feeling he might agree. In one of the most charming parts of the book he tells her through a cloud of cigarette smoke, "Patti, you got famous before me." She dubs Mapplethorpe her "knight," but this reader cared thanks to the love she invested in him. Mapplethorpe, of course, was an artist and all the writing about art in the world cannot replace the actual experience of it. Perhaps he is shortchanged by the autobiographical form; try as his muse does to honor him. Although we rarely accuse anybody of being too old to rock 'n roll anymore, writing remains a mature person's game. So it was Smith's good fortune to be a writer first, a musician later, and a writer now, because she brings lit-passion and a high level of skill to "Just Kids." "We imagined ourselves as the Sons of Liberty with a mission to preserve, protect, and project the revolutionary spirit of rock and roll. We feared that the music which had given us sustenance was in danger of spiritual starvation. We feared it was losing its sense of purpose, we feared it falling into fattened hands, we feared it floundering in a mire of spectacle, finance, and vapid technical complexity. We would call forth in our minds the image of Paul Revere, riding through the American night, petitioning the people to wake up, to take up arms. We too would take up arms, the arms or our generation, the electric guitar and the microphone." 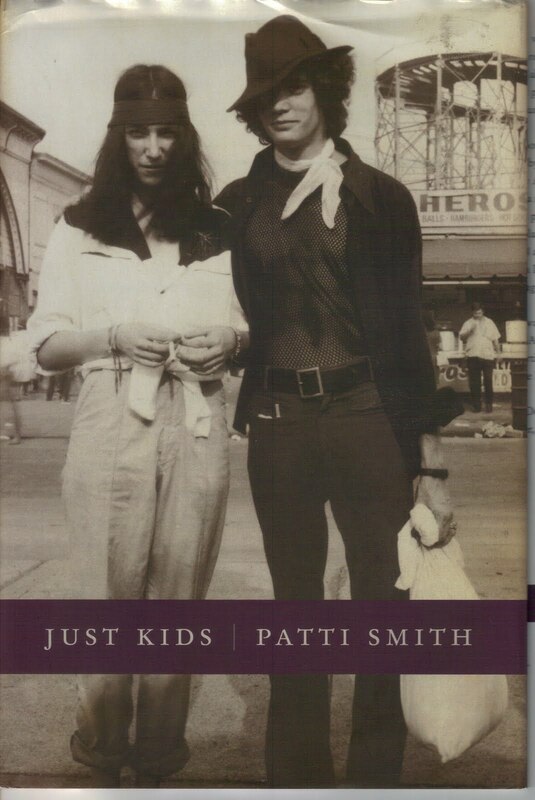 But she is, in "Just Kids," nothing if not a dramatist scripting the play of her own life, decorating it with universal symbols, inserting Patti Smith into art history's larger arc. There are persons and outlets, many in the very cultural current Smith helped generate, who find such self-positioning both cloying and pretentious. Worms squirm in the mud and we are all welcome to join them. Walking with the deities is the tougher task and should be worthy of our admiration.